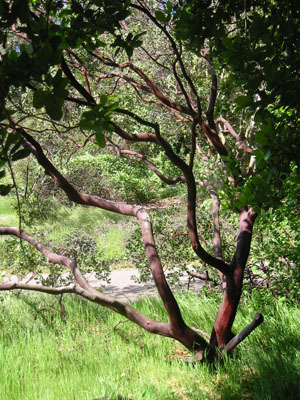 If local gardeners rightly consider the Bay Area a slice of Eden, then the manzanita deserves special attention: its name is Spanish for "little apple." Knowledge and sin may not necessarily derive from this gorgeous evergreen, but temptation lurks always among its branches. As pioneer horticulturist Lester Rowntree famously opined, "If I were forced to choose only one shrubby genus, giving up all others, I would say unhesitatingly 'Manzanitas, please,' for they can be all things at once to the lover of shrubs, giving you complete satisfaction at any time of year." More accurately called Arctostaphylos (Greek for "bear grape"), this genus comprises 70 species, nearly all native to the California chaparral, with habits from low creeping ground covers to aspirant trees 20 feet tall. Such variation means there's a manzanita for every garden milieu, and to suit any gardener's taste. The taller forms, like Arctostaphylos manzanita (common manzanita), A. insularis (island manzanita), and A. glauca (big berry manzanita), are prized for the arresting shapes of their branches: gnarled and twisted yet surprisingly smooth to the touch, in rich variations of purplish red, they glow in the sun like burnished mahogany. Snake-like, the branches shed bark in paper-thin curls every year, allowing the trunks to expand over time. The plant becomes festooned with these ribbons of shredded bark during the summer, but eventually is washed clean by the rains of late fall; the shiny wood underneath makes a beautiful stage for the coming winter show. Continue reading Manzanita Charms Bay Area Terrain →.